The competitively priced SSD (Solid State Drive) is rapidly growing in popularity amongst Macbook users, with sales of the Renice K3E Series 1.8" 40PIN PATA ZIF SSD increasing as users want to speed-up their devices. Sales amongst PC and notebook users are also on the rise. The competitively priced Renice K3E Series 1.8" 40PIN PATA ZIF SSD is rapidly growing in popularity amongst Macbook users, with sales of the SSD increasing as users want to speed-up their devices. Sales amongst PC and notebook users are also on the rise. As a fast-growing manufacturer specializing in industrial-level SSDs, Renice first began providing these drives to the consumer market several years ago. High quality and competitive pricing have driven an increased demand for the Renice K3E Series 1.8" 40PIN PATA ZIF SSD amongst Apple Macbook AIR Rev. A users, as well as consumers with PCs and other notebooks since its release. This drive is highly recommended by experts and editors alike and has earned high rankings in the SSD consumer market. Build with PATA interface, this SSD shows versatility in all major operating systems; particularly with Apple’s line of Mac computers. A Japanese editor found that the Renice K3E Series 1.8" 40PIN PATA ZIF SSD, when used with a Mac, brought the large capacity of 240GB while delivering transfer speeds of up to 120MB/s. All Renice SSDs use Conformal Coating and this 1.8” ZIF SSD is no exception. SSDs are known to provide stable transportation and good performance over years of use depending on their coating. High quality manufacturing is of the utmost importance to Renice, whose warehouse is located in Asia. The Renice K3E Series 1.8" 40PIN PATA ZIF SSD offers stable performance and a powerful consumption profile at an affordable price. It is highly recommended for all Macbook AIR Rev A users and has sold very well on b2cit.com. 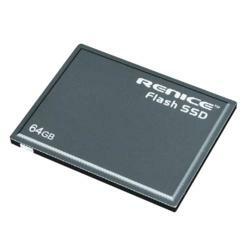 Renice Technology Co., Ltd is a professional manufacturer of SSD (solid state drive), with offices in HK and different cities of China, e.g. Shenzhen, Shanghai, Beijing and Chengdu. High quality and reliable products as well as best service is always our goal, with passionate and talented staff, professional R&D team, advanced production technology and strict quality controlling system, we can quickly response to customers’ needs, and provide qualified products and a full range of professional services and supports to all over the world.